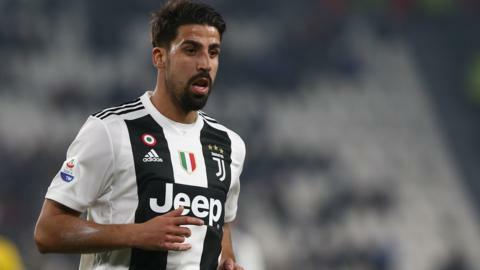 Juventus midfielder Sami Khedira is to have knee surgery after "four months of continuous pain". Shares tumble after Juventus is knocked out of the Champions League by Dutch club Ajax Amsterdam. Messi primed to claim Ronaldo's crown? Cristiano Ronaldo will not win a fifth-straight Champions League title. Can Lionel Messi take it? Read more on Messi primed to claim Ronaldo's crown? Captain Matthijs de Ligt says Ajax's progress to the Champions League semi-finals, via wins over Juventus and Real Madrid, has left him speechless. Who is Italy's rising star Moise Kean? Read more on Who is Italy's rising star Moise Kean? Can Messi match Ronaldo's goals record? Read more on Can Messi match Ronaldo's goals record? Manchester City manager Pep Guardiola denies newspaper reports that he has agreed to join Juventus, and says he will remain at City for "at least" two more years, unless they sack him. A European Super League: The future of football? Read more on A European Super League: The future of football? Who is the toughest opponent Chiellini has faced? Read more on Who is the toughest opponent Chiellini has faced? Manchester United should still be worried about Sunday’s Manchester derby despite their famous victory over Juventus in Turin, says ex-striker Dion Dublin. What now for Pogba - and could anyone afford him? Could Paul Pogba be on his way out of Manchester United? And if he does leave, where will he end up? Read more on What now for Pogba - and could anyone afford him? Who's on the move around Europe in January? Which of Europe's top players could be on the move in the January transfer window? Read more on Who's on the move around Europe in January? Robbie Savage says Man City must sign Paul Pogba, but what do the rest of the top five need to challenge Chelsea? Who will cause an upset in Europe? Could Manchester City gain Barca revenge and will Juventus underestimate Borussia Dortmund in the Champions League? Read more on Who will cause an upset in Europe? Juventus midfielder Andrea Pirlo on how coach Antonio Conte has masterminded a hat-trick of Serie A titles. Read more on 'Greatest comeback story in sport' as Woods wins Masters - do you agree?